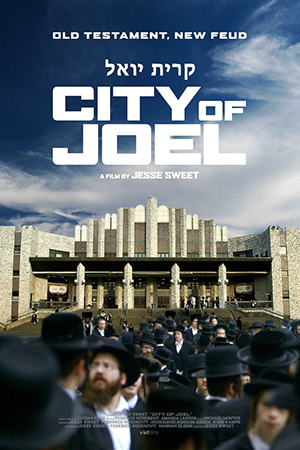 "City of Joel" is a documentary - with unprecedented access - to a 1.1 square mile shtetl in the suburbs that is home to 22,000 members of one of the most insular and orthodox Hasidic sects. We follow the battles they are waging to survive. Just 50 miles north of New York City, the Satmar sect has built Kiryas Joel as a religious haven where they can be fruitful, multiply and follow the 613 rules of the Talmud. But with some of the highest rates of marriage, birth and religious observance in the country, they have been almost too successful. Developers have come up with a plan to double the size of the village to keep up with this growth, but their neighbors fight back because they believe it will harm the environment and tilt the balance of political power. Kiryas Joel - which means City of Joel - is named for former Joel Teitelbaum, one of the few Rebbes - or religious leaders - to survive the Holocaust. By the 1970s, he worried that his followers were losing their way. So Teitelbaum created an isolated village where every aspect of life revolved around Jewish law. Our film explores how this ultra-orthodox faith has become both a source of strength and tension in Kiryas Joel. In the tradition of rigorous observational documentaries, we present the people on all sides of a conflict - from religious zealots to dissidents, from rabbis to people who doubt their own faith as they struggle to find their own place in the City of Joel.